Population pyramids show the age and gender structure of a population. They can be used to predict what will happen in the future and predict what services may be needed. · Population pyramids are an important tool used in demography. · Age distribution of the population can be seen at a glance. · money to pay old age pensions or alternate polcies to address the social and economic needs of the elderly. The dependency ratio of a population refers to the percentage of the population which is over 65 together with those under 15. Together, this part of the population is considered to be out of the work force and therefore they must be supported by the rest of the population. Draw a horizontal axis and add the scale. Remember to start in the middle with your scale and represent the males on the left and the females on the right. Draw two lines in the centre of the graph as your vertical axis. Label the age groups starting with 0-4 years and then increasing in 5 year age groups up the graph. Using the data plot the bars with data for males on the left and data for females on the right. Don’t forget to label your graph! (i) Graph the data on a population pyramid; use a RED pen to graph the data for males and a BLUE pen to graph the data for females. 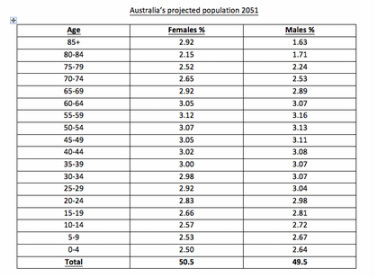 (ii) Which age group is likely to be the largest in 2051? (iii) What facilities will they need? (iv) What implications do you think the data would have for the nature of Australian society? (v) Which age group will you belong to? How do you think you will be contributing to society?